Warlords Battlecry II is a real-time strategy and role-playing game, developed by SSG as the sequel to Warlords Battlecry. It was released on March 12, 2002. 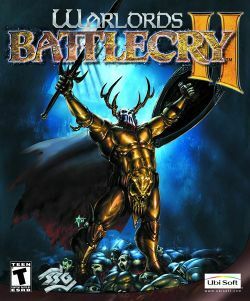 Warlords Battlecry III, the sequel to the game, was released in 2004. The game requires the player to build buildings and create units in order to defeat the enemy, whilst sending their hero on optional quests. The game is set within the world of Etheria. In the campaign the player must take control of one of the twelve races and capture all sixty-seven regions of the land in a non-linear manner. The player does this whilst assuming the role of a "Hero" which he or she has created. There are twelve different playable races, each with their own type of Hero, buildings and resource dependencies. This page was last edited on 16 August 2016, at 18:01. This page has been accessed 14,155 times.